Aging generally results in physical deterioration, including a loss of muscle tone. 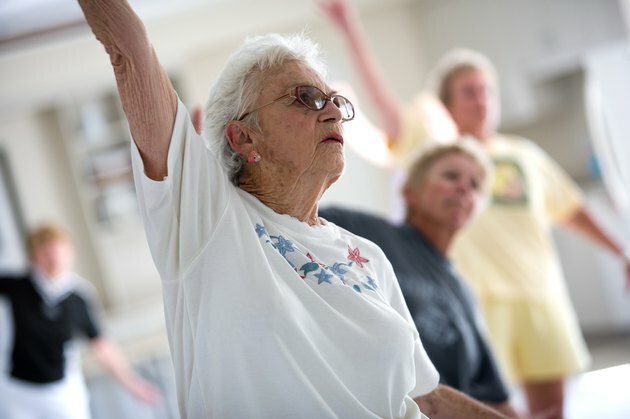 Even seniors who stay in shape may experience increased muscle weakness and flabbiness over age 70. The percentage of people who lose muscle mass rises to over 50 percent at age 80 from 13 to 24 percent at age 70, according to Dr. Ronenn Roubenoff, associate professor at Tufts University School of Medicine. Exercise and conditioning can help you regain or preserve muscle tone in your arms, even after age 70. Resistance training can increase muscle mass and strength even into your 90s, according to physical therapist Dr. Bruce Craig, but muscle becomes inelastic and injury can occur as you age. To avoid injury, warm up your muscles before starting to exercise with five minutes of walking or riding a stationary bike. Stretch for 10 minutes to make your muscles warm and pliable to decrease the risk of injury. Using weights tones the upper and lower arms. You don't have to buy expensive weights; soup cans will do to start, especially if you're over 70 and haven't exercised for a while. If you do use dumbbells, start with weights less than 5 pounds for women and 8 pounds for men. To build up your biceps, hold one weight in each hand while sitting or standing with your arms straight down. Bend your elbows slowly and raise the weights up to you shoulders, then lower them slowly. Repeat in three sets of 10 to 15 repetitions. Alternately, exercise only one arm at a time. In addition to toning muscles, lifting light weights also helps keep your bones strong. Even seniors over 70 sometimes need to get rid of stress. If you don't want to use weights and feel the need to get rid of some aggression, try punching. Hold both arms with elbows bent. Push your right arm straight out while keeping you left at your side, then switch arms. Repeat 10 to 15 times in three sets. If you're over 70, you may have trouble reaching up into tall cupboards or even raising your arm to brush your hair for prolonged periods. To strengthen and tone the muscles that help you reach, try lifting weights over your head. Bend both elbows, keeping you hands near your shoulders. Slowly lift your arms over you head using both arms at a time, then lower them. If you have trouble using weights with this exercise at first, start with empty hands. As this exercise becomes easier, add light weights.